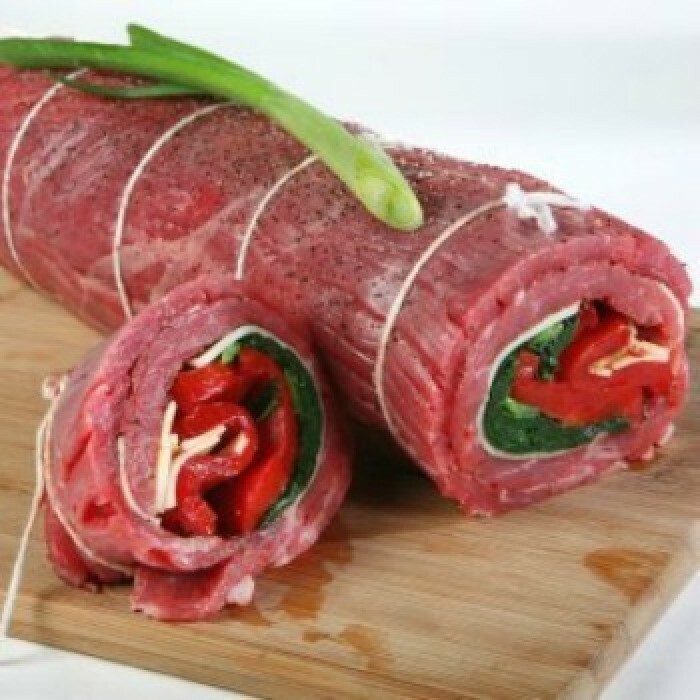 Whether you thinking about marinating and grilling one or making a stuffed flank steak, a well prepared flank steak makes a delicious meal. This page contains flank steak recipes. Nice Oriental flavor to this steak. Combine soy sauce, garlic, and ginger in shallow pan. Add steak, coating well. Marinate for 1 hour. Place steak on rack in broiler pan or on grill. Broil or grill for 10 minutes on each side. Combine all ingredients except the steak and mix well. Marinate the steak in the refrigerator at least 5 hours, turning several times. Grill approximately 4-5 minutes for each side for serving rare. Slice thin, diagonally across grain. Serve heated marinade to pour over steak, if desired. Pour flour into flank steak on both sides. Brown well on both sides. Place in roaster. Add tomatoes, seasoned as you like them. Cover and bake at 325 degrees F for 2 hours. Trim off excess fat from steak. Combine first 7 marinade ingredients in baking dish. Save 1/4-1/2 cup for serving over steak when done. Coat steak with marinade. Allow to sit for 1 hours at room temperature. Prepare charcoal in grill. When coals are ready, grill steak for 5 minutes on each side for rare, 2-4 minutes longer for medium. Place on carving board. Slice on the diagonal into thin slices. Season with salt & pepper. Pour remaining marinade over steak. Score surface of the steak, making diamond shapes 1/2 inch deep. In a large resealable plastic bag, combine the remaining ingredients; add the steak. Seal the bag and turn to coat; refrigerate at least 2 hours, turning occasionally. I am looking for a Weight Watchers recipe for marinated flank steak. It was in recipe book from the late 60's or early 70's. I think it was called Japanese Flank Steak. I believe it used ginger as one of the ingredients. I have a newer WW cookbook from a couple of years ago that has a recipe for marinated flank steak. It might be an updated version of the recipe you are looking for. The directions (which are wordy) call for mixing the marinade ingredients (up to the flank steak above) in a gallon zip top bag and then add the steak. Refrigerate, turning occasionally overnight, or up to 24 hours. Remove meat from refrigerator 30 minutes before broiling. Preheat broiler. Discard marinade and pat steak dry with a paper towel, then drizzle with the oil. Broil 3 inches from heat, turning once and sprinkling the salt on the cooked side, about 4 minutes a side. Season with pepper. Transfer the steak to a cutting board, let stand 2-3 minutes then cut on diagonal into 12 slices. Jess, does this recipe in your WW book give nutritional information and/or points? Thanks for sharing.